Carl took the last few days off work to allow me time to go and see my Dad at the hospital whenever I felt like it. I am so incredibly grateful for a husband that loves his in laws like he does and genuinely cares about them as if they were his own parents. 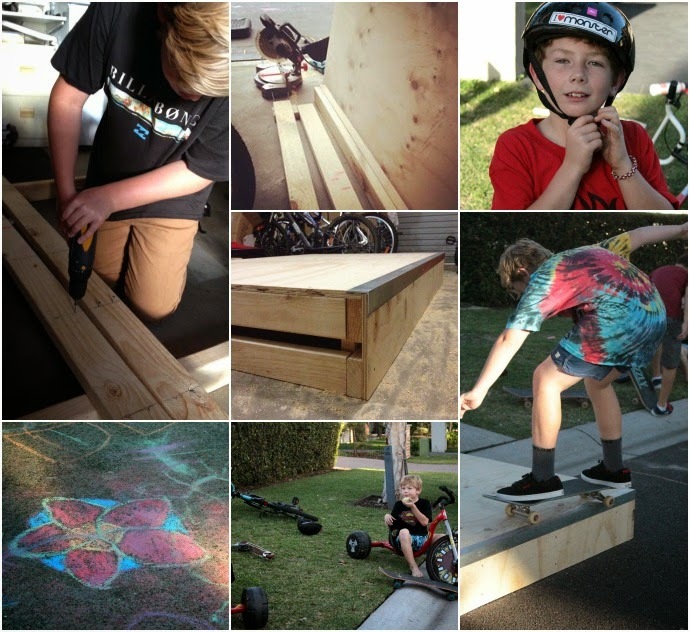 The kids of course loved having Dad around and they set about getting stuck into a project they have been wanting to do for ages - building a skate grind. Now I have no idea when it comes to anything skate related. My involvement goes as far as shouting at them to wear their helmets and applying ice packs and Betadine to the numerous wounds they self inflict when they stack. I have no idea how much this one cost to build and it doesn't really matter as buying one would have totally defeated the purpose of what my hubby and boys were doing. Huddled together measuring and screwing, bumping into each other and dropping large pieces of wood onto each others toes - they were creating memories. Memories that one day our boys will tell their own children about. Memories that will one day keep them company at night when they need it the most. You cant buy that for $500 bucks can you? Do you have memories of making anything with your parents when you were a kid?